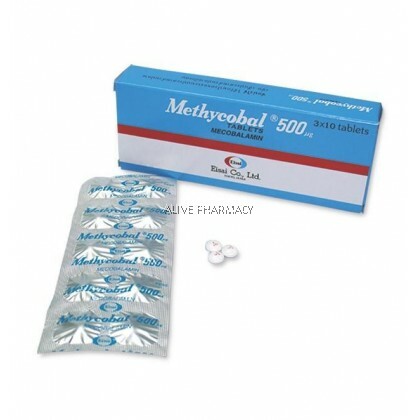 Methycobal (Mecobalamin Preparation) Methycobal is a mecobalamin preparation developed by Eisai Co., Ltd. as a treatment for peripheral neuropathies. Methycobal contains mecobalamin, a vitamin B12-coenzyme that occurs in the blood and the cerebrospinal fluid; it is taken up by nerve tissues more actively and extensively than other homologues of vitamin B12. Biochemically, Methycobal accelerates the metabolic pathways of nucleic acids, proteins and lipids through its involvement in the transmethylation reaction; thus, it exerts a repairing effect on injured nerve tissues. Clinically, Methycobal is the first pharmaceutical product that has been shown, by double-blind clinical studies, to be effective and useful for the treatment of numbness, pain, and paralysis due to peripheral neuropathies such as diabetic neuropathy and polyneuritis. Composition Each tablet contains 500 µg of mecobalamin. Indications Peripheral neuropathies Dosage and Administration The usual daily dose for adults is 3 tablets, equivalent to a total of 1,500 µg of mecobalamin, administered orally in 3 divided doses. The dose should he adjusted according to the age of patient and severity of symptoms. 1) General Methycobal should not be administered for extensive periods (months) to patients who show no clinical response. i) Gastrointestinal: Symptoms such as anorexia, nausea or diarrhea may infrequently occur. ii) Dermatological: Skin rash may rarely occur. 3) Other Prolonged use of larger doses of Methycobal is not recommended for patients whose occupation requires handling mercury or its compounds.